Pelican Product: 9781589805217, GINGERBREAD MAN SUPERHERO! An evil macaroon takes a bunch of frightened brownies hostage, and only the Gingerbread Man can save them from their sticky situation! With raisin eyes, a licorice mouth, and a kitchen towel for a cape, the superhero swiftly flies to the rescue. Flying sesames seeds and stampeding animal crackers are just a few of the dangers the tasty treat must face to defeat the wicked dessert. Ladyfingers and sugar cookies watch in suspense as the two sweets struggle for victory. Not one to crumble under pressure, the Gingerbread Man valiantly shouts “Flour Power!” just as he saves the day. This version of the classic Gingerbread Man story is sure to satisfy the sweet tooth of readers everywhere. Joe Kulka’s fanciful comic-storybook art enhances Dotti Enderle’s menagerie of confectionary characters. 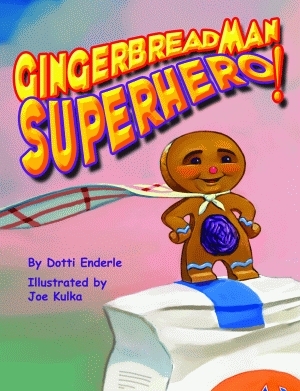 Dotti Enderle is a celebrated author who loves to entertain children with her imaginative storytelling. She is a member of the Society of Children’s Book Writers and Illustrators, the Houston Storytellers Guild, and the Writers’ League of Texas. 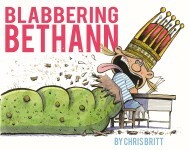 She is the author of Pelican’s The Cotton Candy Catastrophe at the Texas State Fair, The Fat Stock Stampede at the Houston Livestock Show and Rodeo, Hidden, and Granny Gert and the Bunion Brothers, which was her first collaboration with Joe Kulka. She resides with her family in Houston, Texas. Joe Kulka is an award-winning illustrator and author. Since earning a BFA in illustration from the University of the Arts in Philadelphia, he has provided images for medical textbooks, MTV, and Sony PlayStation®. Kulka is the author and illustrator of Pelican’s The Rope. He enjoys spending time with his family in Quakertown, Pennsylvania. Click here for Chapter 1. Click here for Front Matter. Click here for the Gingerbread Man Superhero! activity guide.